Make dinner a selfless act by joining us for a fundraiser to support Suffolk Community College Foundation. Come in to the Chipotle at 261 Middle Country Rd in Selden on Tuesday, November 14th between 5:00pm and 9:00pm. 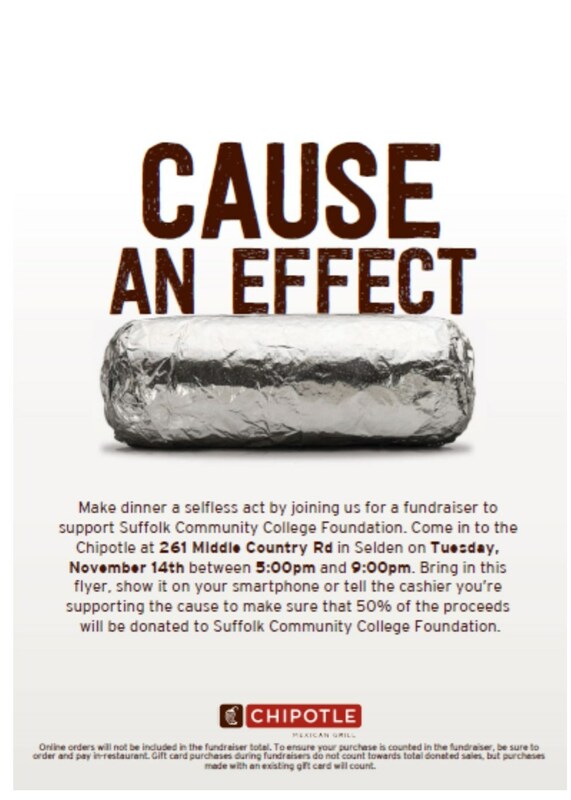 Bring in this flyer, show it on your smartphone or tell the cashier you’re supporting the cause to make sure that 50% of the proceeds will be donated to Suffolk Community College Foundation. Posted on October 9, 2017, in Events and tagged #SCCCAlumni, #SUNYSFLK, Alumni, Alumni Association, Community, Faculty, Fundraiser, Philanthropy, State University of New York, Students, Suffolk County Community College, SUNY. Bookmark the permalink. Leave a comment.